Giving someone flowers is a special gesture. When it comes to flowers, you want them to be perfect whether they’re for that special someone or for a celebratory occasion. If this task isn’t already daunting enough, there are so many flower colors and types to choose from. It’s important to know the many hidden messages and symbols behind flowers, as you shouldn’t give your girlfriend the same flowers you’d bring someone grieving the loss of a loved one. Across the ages, many cultures placed heavy importance on the symbolism of flowers. As early as ancient times, flower species were associated with specific gods and presented to them as gifts and sacrifices. It wasn’t until Victorian times that flower color was important as well. In that time, flowers were popular in sending secret messages, especially romantic messages to someone you secretly admired. The color shade of the flowers symbolized the intensity of the message or emotion the flower stood for. Red – Red is a vibrant, stimulating color is commonly known to represent strong feelings of love, passion, and emotion. A bouquet of red roses, the flower of love, is a a classic romantic arrangement. Pink – Pink flowers are also a classic representation of love and sensitivity. It is a feminine color, commonly presented to women. Its soft color represents the tenderness of one’s love. Dark Pink – Specifically dark pink flowers are the traditional color of choice to say “thank you.” Dark pink flowers symbolize gratitude, appreciation, and recognition. Yellow – Yellow is bright, uplifting, and friendly and when gifted yellow floral arrangements, your loved one’s day instantly brightens up as a return for their kind act. 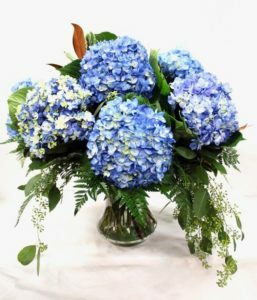 Blue – With funeral flowers, it is wise to select colors that are calming and sensitive, as this is a sensitive and difficult time. Those grieving need extra feelings of calm, serenity, and peace – all emotions represented by the color blue. Purple – Purple is a sensitive and compassionate flower color, as it also has a calming effect. Purple inspires reflection and spirituality, fitting as people often reflect on their own life, the life of the deceased, and spiritual beliefs at memorial services. White – White stands for goodness and light. It triggers positive emotions and used to cheer up the grieving. White also represents sacred things, heaven, and resurrection, giving religious grievers a reminder of hope. Green – Green is a great color to celebrate the birth of a new baby as it symbolizes life and renewal. Green flowers are also a way of wishing the baby healthy and happiness, as green flowers also stand for growth and health. Blue – Depending on the gender of the new baby, floral arrangements are given in pink or blue to reflect the newborn’s gender. Blue is the standard color of masculinity, suitable to gift to the family of a newborn boy. Pink – Pink floral arrangements celebrate the arrival of a newborn girl as pink represents femininity and is the traditional color for girls. 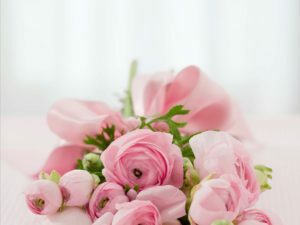 The pink flowers also symbolizes love, tenderness, and nurturing, making pink an appropriate bouquet color for new mothers. Many varieties of color are appropriate for Graduation flowers and gifts. Select floral arrangements in the graduate’s school colors or their favorite color to celebrate their big day. Graduation is a celebration, so bright flower colors are a great way to represent the happy occasion. Red – Red stimulates emotion and symbolizes love, courage, and excitement. It’s the perfect color as graduates often feel excited and courageous in their achievements. You can also wish them good luck in their future, as red is a lucky color in Chinese tradition. Orange – Orange represents encouragement, excitement, and happiness – all emotions felt on big days such as birthdays and graduation. Yellow – Yellow represents energy and success – both qualities thought of on graduation day, as graduates work hard and persevere to achieve their academic success. Orange – Orange flowers instantly brighten up everyone’s day. Orange is a bright color that represents enthusiasm, happiness, and encouragement. Pink – Pink symbolizes sensitivity and nurturing. Present pink flowers to the women in your life who need extra encouragement in their healing and recovery. Green – Wish good health to your sick loved one with green flowers, as they symbolize growth and health. They’ll feel the extra boost they need to get better. Pink – Pink symbolizes both love and femininity. Let your mother know how much you love her and honor her title of mother with pink flowers. Purple – Purple inspires reflection, fitting for a holiday that causes a lot of reflection on the effect our mothers have on our lives. Purple also represents sensitivity and compassion, qualities found in all of our mothers. White – Remind your mother of the positive, good influence she is with white flowers as they evoke positive feelings and symbolize light and goodness. Get your perfect colored floral arrangement at Johnson Floral & Decor as they have floral arrangements and gift baskets for all special occasions and holidays. Call (208) 342-5687 today to place your special order with our Boise florist.